There are many sports athletes with tattoos. Zane Swanston; business owner of Zealand Tattoo, has tattooed a number of New Zealand athletes including The Black Caps Captain; Brendon McCullum and Owen Franks; former All Blacks and Crusaders prop. Have you ever wondered how to show peace, love or passion within a tattoo? Here at Zealand Tattoo, we produce specialised Maori tattoos, Polynesian tattoos and Japanese tattoos that are uniquely designed to describe your story. Our artists are very knowledgeable with over 20 years experience in the tattoo industry. Zane Swanston has tattooed New Zealand sports celebrities while working at Zealand Tattoo, including Brendon McCullums’ tattoo on his right arm. Brendon McCullums’ tattoo is a scroll containing the Roman Numerals CXXVI XLII CCXXIV. 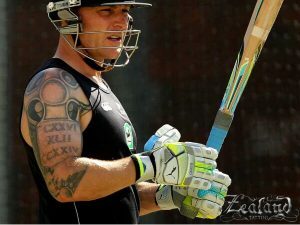 McCullums’ arm tattoo symbolises where he places within the list of cricketers who have had the honor of representing New Zealand within international cricket. Brendon McCullum is not the only cricketer that has a tattoo. English cricket player, Kevin Pietersen has a Maori sleeve tattoo on his right arm. Zane Swanston also tattooed Owen Franks back tattoo. 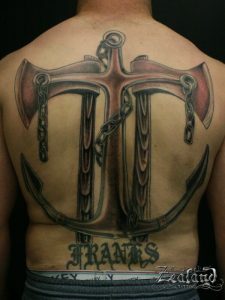 Franks’ back tattoo is of an anchor and two axes. His family who come from the sea and are fisherman, inspired this tattoo. The two axes symbolise his barbarian ancestry. “It’s basically that, nothing too special” Franks quoted. Beside him in the All Blacks team with Polynesian tattoos were Ma’a Nonu, Jerome Kaino and Sonny Bill Williams. Ma’a Nonus’ tattoo is a ¾ Polynesian tattoo arm sleeve on his right arm as well as a Polynesian band tattoo on his left. Kainos’ Polynesian tattoo starts on his right shoulder, which was designed from his village. Sonny Bill Williams’ Samoan tattoo includes spearheads, which is designed to express courage and fight. There are many sports celebrities with tattoos. Dwayne “The Rock” Johnson; WWE Wrestling champion, has a traditional Samoan style tattoo over his left shoulder expanding into a ½ sleeve. 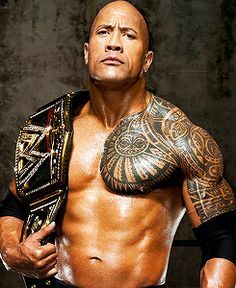 The Rock’s tattoo represents his cultures, how he overcame his struggles and in cooperates the beliefs of his ancestors. David Beckham tattoos are a tribute to the important people in his life. Beckham has two full sleeves, back and neck tattoos.